I recently got interviewed about my beauty routine for a feature on Garance Doré. You can read my Beauty Minute on their site, or continue reading to check out my daily beauty regimen and go-to products. By no means do I use all of these products every day, but the ones listed below are some of my favorites that make me look and feel my best! I have sensitive skin, so I prefer to use brands that use clean, simple, and high-quality ingredients. I usually just rinse my face with water in the morning instead of using a cleanser. Then I use Osmia Organics Active Gel Toner. I add True Botanicals Vitamin C Booster to my True Botanicals Cellular Renewal Serum (which activates it), and apply that mixture next. Then I finish with either Osmia Organics Purely Simple Face Cream or Sunday Riley Juno Hydroactive Cellular Face Oil, depending if I want something lighter or more rich (and don't forget your neck!). My lips always get a thick coat of Aquaphor in the morning. I take a probiotic every day, and like to have hot lemon water if I can as well. I’ve also been loving Sun Potion supplements in my morning coffee or smoothie! For fragrance, my go-tos are by Tom Ford- I love Violet Blonde or Oud Wood, depending on my mood! I rarely wear makeup when I'm not working- it feels nice to give my skin a break! If I'm wearing makeup, it's usually just the basics. I like a lot of Glossier products- they make great no-frills essentials. I use a tinted moisturizer (with SPF!) by Laura Mercier or True Botanicals, and concealer if need-be by Glossier (Stretch Concealer) or RMS Beauty (Un Cover-Up) on the face. Curled lashes, with or without mascara, but I like Charlotte Tilbury Full Fat Lashes. Groomed brows are a plus, and Glossier Boy Brow has a nice waxy texture. Glossier Haloscope and RMS Beauty Living Luminizer for highlights on the cheekbones and brow bones help give you that dewy glow. I rarely wear lipstick, but a red lip is fun every once in a while, and YSL Rouge Pur Couture has lots of great shades. I always have a good lip balm with me. Glossier Balm Dotcom and Lano Lips 101 Ointment Multipurpose Superbalm are go-tos, and I also just brought several tubes of Lucas' Pawpaw Ointment back from Australia. I also like to have a facial mist of some sort for whenever I feel like my skin needs a pick-me-up. Tatcha Luminous Dewy Skin Mist and Tata Harper Hydrating Floral Essence are both great. I drink tons of water throughout the day as well. My nightly regimen starts with removing any makeup (if I'm wearing any) with Bioderma Crealine (aka Sensibio). Then I wash my face with Osmia Organics Black Clay Facial Soap or Sunday Riley Blue Moon Cleansing Balm (this one also makes a great mask). I tone with Biologique Recherche P50 (without phenol), then apply Mario Badescu Buffering or Drying Lotions to any blemishes if needed. 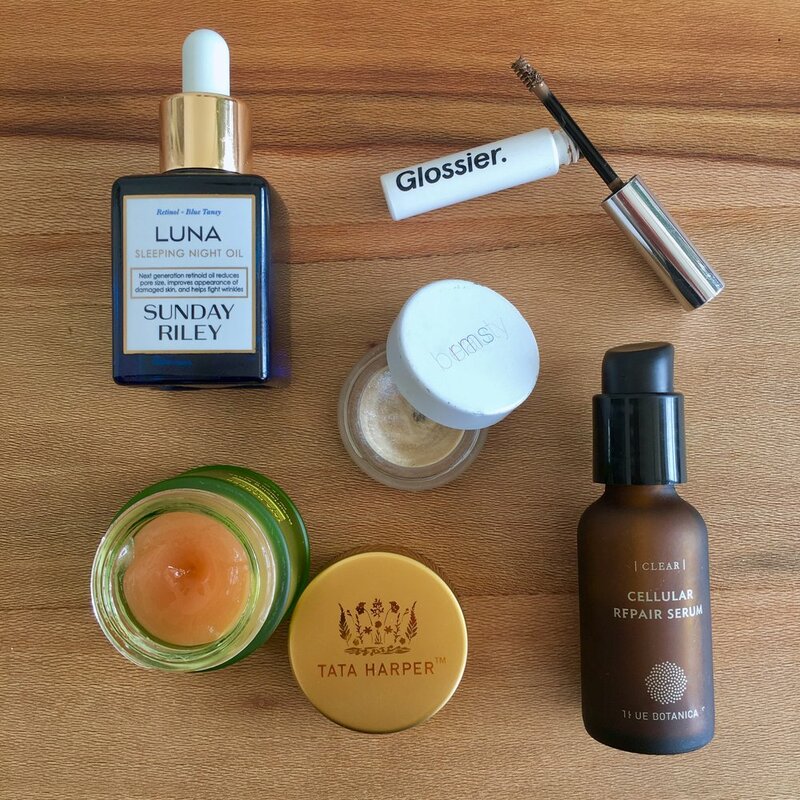 I love a hydrating & calming oil at nighttime (something thicker than moisturizer) and Sunday Riley Luna Sleeping Night Oil or UFO are amazing. Eye cream is also important to start sooner rather than later- I've been loving Tata Harper Restorative Eye Creme.